Originally published in Creation 13, no 1 (December 1990): 16-17. What about our hands and feet? Do they show any evidence of a more ‘monkey-like’ condition in the womb? The ‘biogenetic law’ made popular by Ernst Haeckel (who was Darwin’s chief apostle in Germany) states that the embryo, as it develops in the womb, goes through various stages of development which show the features of its supposed evolutionary ancestors. Even though Haeckel admitted to having fraudulently altered his diagrams to support his theory, many still believe (incorrectly) that the human embryo has gill slits, a tail and a yolk sac, for example. These ideas have long been discredited by embryologists. What about our hands and feet? Do they show any evidence of a more ‘monkey-like’ condition in the womb? Human hands are unique compared to the rest of the animal kingdom, as are our feet. The combination of an opposable thumb (the thumb being able to touch the tip of any of the other fingers) and our being able to rotate the hand freely (palm up or palm down, shared with primates) gives us an ability to manipulate objects and tools like no other creature alive, even if they felt so inclined. Darwin quoted Professor Owen as saying that the big toe, which functions as a bracing point in both standing and walking, is perhaps the most characteristic aspect of the human build. Human feet are most certainly not designed for grasping or climbing trees. Our big toes are used to push off against the ground, to grip the ground, as it were, but generally not to grip objects. 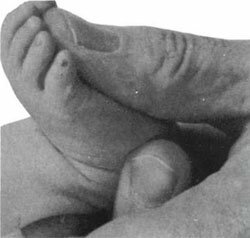 Infants can often be lifted by a compression grip between the big toe and the second. Some races of men have this ability in quite marked form, which is used by disabled foot/mouth painters. However, it is nothing like the curling, gripping foot of tree-climbing primates. What does the development of hands and feet in the human embryo tell us, then? 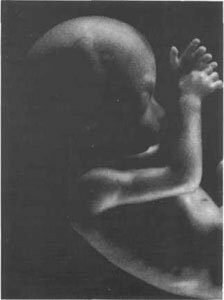 In a six-week-old, 11-millimetre-long embryo, one can already see the regions from which the limbs will develop. Only one week later, the five-fold digitization of the hand is clearly visible, even though the feet are still like paddles. It takes another week for the feet to ‘catch up’ in this regard. At 15 millimetres one already can see the later function of these limbs mirrored in their early movements. Motions of the upper limbs are ‘hugging’, whereas the lower limb movements are of a pushing, bracing nature. There is never the slightest hint of any climbing function. At three months, the embryo, in spite of only weighing about 30 grams (little more than one ounce) can already make a fist and oppose the thumb. Its feet are spread-eagled, but in contrast to the hands, they never make any gripping motions. It has been shown that at 16 weeks an embryo is able to grip a small rod firmly. At six months it can grip it so tightly as to be able to be lifted up by it. At this time the foot is a fully formed standing/walking structure (although to mother at this time ‘kicking’ is probably the word that most readily springs to mind!). The myth that ‘swimming webs’ develop temporarily between toes and fingers has also long been laid to rest, along with the others mentioned earlier. At three months, the foot looks identical to that of a new-born baby. Human beings do not give any sign in their embryonic development of anything other than an upright posture, two-legged walking, and a freely opposable, rotatable hand. Professor Blechschmidt has undertaken extensive research (1970-1983) into human embryology. His anatomical preparations are extremely comprehensive, as they fully document the development of the embryo from fertilized egg onwards. Some still imagine embryos show relics or vestiges from presumed animal ancestors, such as a gill stage, tail stage or worm stage. They jump to conclusions about our inheriting such features from ancestors. But Blechschmidt insists these people ‘can never have personally studied human embryos’ otherwise they would not have come to such groundless conclusions. Blechschmidt maintains that this so-called ‘fundamental biogenetic law’ (also known as ’ontogeny recapitulates phylogeny’) is utterly wrong, and that its influence has set back scientific embryology a hundred years. Sadly, in spite of the fact that similar statements have come from embryologists off and on since well before the Second World War, such beliefs still hold a strong grip on the minds of not only lay-people, but many scientists. ‘Your eyes saw my unformed body. All the days ordained for me were written in your book before one of them came to be’ (Psalm 139:16). ‘I praise you because I am fearfully and wonderfully made; your works are wonderful, I know that full well’ (Psalm 139:14). 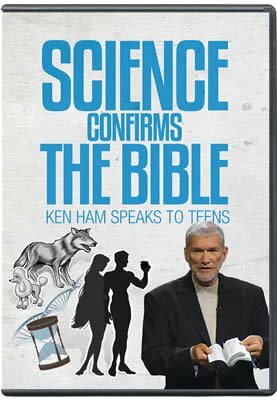 For further reading in this awe-inspiring subject, we strongly recommend the excellent Christian family book Life Before Birth, by Dr. Gary Parker, available from Creation Science Foundation (PO Box 302, Sunnybank, Qld, 4109 Australia) and Master Books (PO Box 1606, El Cajon, CA 92022 USA).